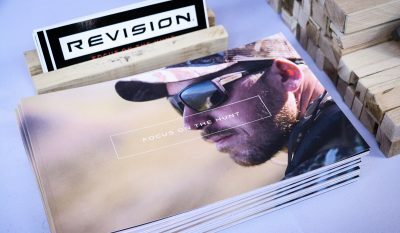 We caught up with the team from Revision Outdoor at Range Day, and got a good look at their entire lineup of technical outdoor eyewear. Some hunters & anglers – myself included – are quite particular about the gear we bring with us in the field, or on the water. So, what Revision did is create a series of technical eyewear – the Pursuer, the Caller and the Seeker – each geared towards helping you perform your best whether you’re glassing up bull elk in the Rockies, or chucking flies for salmon in Northern Michigan. Polarized Slate- A neutral gray lens that tones down brightness and increases contrast. Enhanced perception of blues and greens with no color distortion adds crispness to vision. Consistent across varying weather conditions with superior light reduction this is a fantastic all-purpose tint that will combat eye fatigue during long days on the hunt. Blocks 86% of light and offers 100% UVA and UVB protection. Polarized Cedar- A well-rounded, high-contrast warm tint that produces sharp, bright visuals with excellent glare reduction. With a hint of red to help improve depth perception, this darker lens provides protection against the brightest of conditions while maintaining clarity for use in varying weather conditions. Blocks 88% of light and offers 100% UVA and UVB protection. Polarized Indigo- Slight blue/violet tint that is particularly well suited to water applications. Filters out green, sharpens color perception and reduces glare. Works well in foggy conditions but remains neutral enough for any environment. Blocks 87% of light and offers 100% UVA and UVB protection. Polarized Crimson- Subtle but purposeful pink/red tint enhances vision through increased contrast and sharpened edges. Particularly good on terrain with obstacles like rocks, mud, and holes. Excellent glare reduction and heightened color recognition improve visual depth and reduce eye strain. Works well in both harsh bright light and varying degrees of cloud cover. Blocks 85% of light and offers 100% UVA and UVB protection. Interior of lenses are coated with an anti-fog treatment that absorbs and disperses moisture across a wide surface area to prevent fogging. Our coating far exceeds EN 166 standards for resistance to fogging, so that you don’t miss anything, even when conditions get hot or humid. Exterior water and oil-repellent coating provides an extra protective layer against dust particles, helps shed water, and makes smudges easy to wipe away. We make sure that our coating is strong enough to pass U.S. military standard for resistance to scratching and chemicals. If it can withstand jet fuel and DEET, we think it will do just fine in your sweaty hands. Revision lenses meet some of the same impact and ballistic requirements demanded by the U.S. military. Enough said. Retailing at $279, every piece of eyewear ships with a custom retention strap, an innovative storage system that includes an eyewear pouch with microfiber cloth and a protective dry-bag, and a limited lifetime warranty. The post Revision Outdoor Showed Off Their Technical Outdoor Eyewear During Range Day at SHOT Show 2019 appeared first on OutdoorHub.